Fashion photography is never a bore when you work with models as full of life as Marina Albino. Le Image Inc’s New York fashion photographers recently had the great pleasure of working with new face, Marina. Marina Albino, originally from Brazil, has only been in New York since this fall but she has already been signed by two modeling agencies, Way Models and Trump Model Management. This is the second Way Model test shoot we’ve had at our Brooklyn photography studio. Earlier this fall, our fashion photographers worked with Alexia Bellini from Way Models. Before becoming a fashion model, Marina worked at a hospital as a receptionist. She decided the medical world was not for her and she started her path in the fashion industry by attending open calls at various modeling agencies. Marina Albino was quickly snatched up by several agencies and now travels the globe modeling. For our fashion test shoot, our photographer used only film photography. We photographed the Brazilian model with a mix of Polaroids and medium format film in our New York photography studio and on the streets of Dumbo, Brooklyn. Our photos of the model truly showcase the bon vivant attitude of Marina Albino. 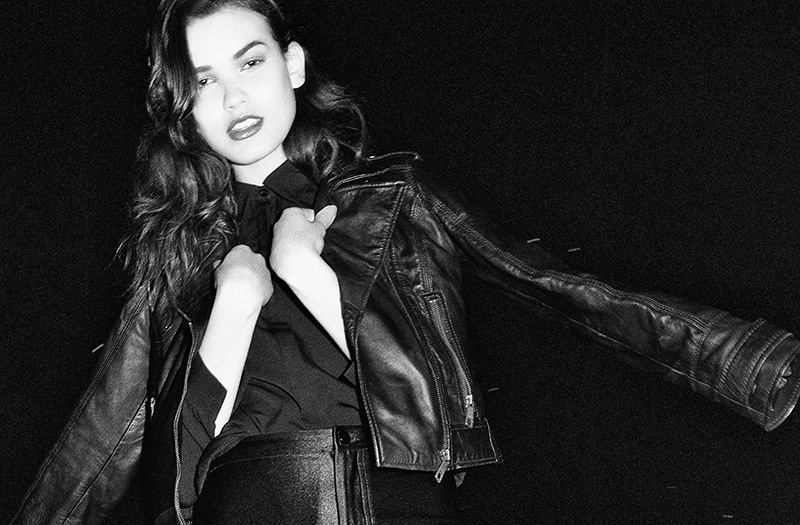 The styling for the photo shoot was kept minimal and cool with trendy leather jackets, wetted hair and red lipstick. It was a great experience working with Marina Albino and we look forward to working with her again. These photos truly teem with life and reflect the great art direction of our Brooklyn fashion photographer. New York fashion photography is always an adventure when you work with models as great as Marina Albino. We wish her continued success in the modeling industry and hope to see her again in our Brooklyn photography studio!